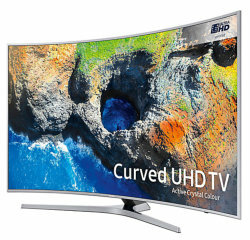 In a nutshell: The Samsung UE49MU6500 is a curved 49-inch UHD TV. This TV is well priced, stylish, with superb Smart TV functionality and connectivity. Picture quality is excellent for a mid-range HDR television, but the curved shape won't be the best option for all homes. The Samsung MU6500 is identical to the MU6400 in all aspects, except that it's curved. The curve adds style, and can create an immersive viewing experience when sitting directly in front of the screen at the correct distance (3 metres.) However, if sitting off-axis, the screen curvature has the effect of reducing the effective screen size, and also exacerbates the screen's most significant defect - the fact that colours, brightness and contrast fade when viewed at an angle. Read our detailed Samsung MU6400 review for more. Bought this tv 3 weeks ago and although it is very good in every aspect its going to be replaced by another set as the internal freeview hd tuner is blocking/pixelating all the time and its driving me nuts..apart from that a good mid range tv but it is not perfect!! !